*Some products in this post have been gifted. It's the most wonderful time of the year... AUTUMN! I bloody love autumn, with it's crisp leaves falling - look, there's one behind me - the crisp chill in the air and the layers, oh the layers. The more layers, the more clothes. The warmer the colour palette, the fluffier the textures, oh it's just so wonderful. We're officially in "jacket weather" here in the UK and as you may have guessed I'm very pleased about it. Just imagine how I'll be when coat weather comes around.. But for now, here's me styling some autumn 2018 trends. I'm wearing brown?! 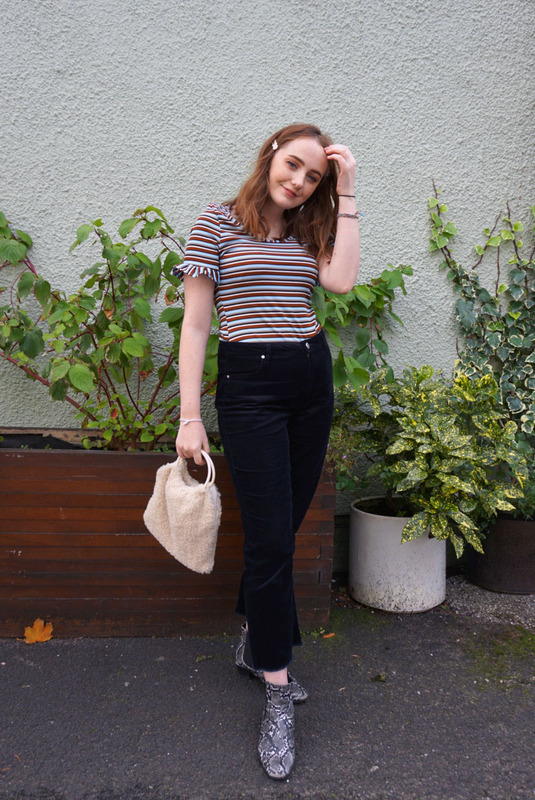 I haven't worn brown in such, such a long time but here I am, incorporating it back into my wardrobe with a subtle brown stripe in this new Miss Selfridge tee. Somehow, the colour combo of pale blue, brown, black and white really does work well together and is something I'll be using for colour inspiration as we delve deeper into autumn/winter. 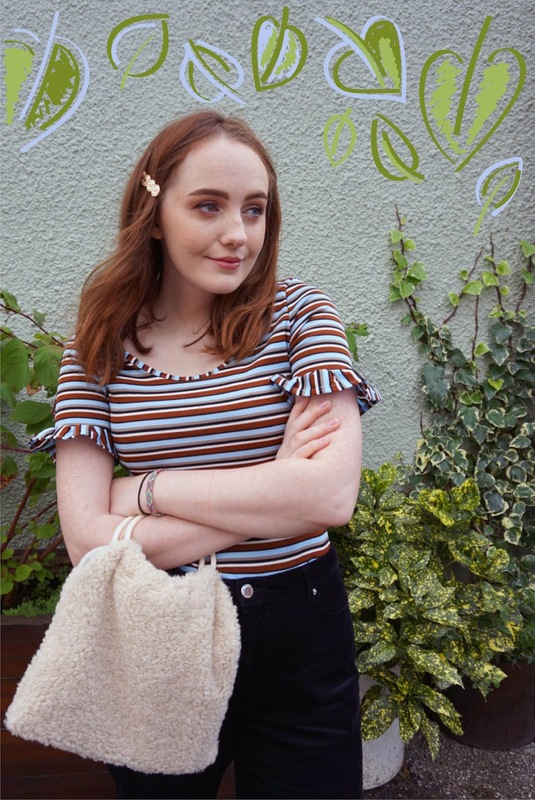 With so many complimenting colours in this cute frilled sleeve tee, there's a lot of outfit options here too, but I'm staying on trend with these kick flare cords, which to be quite honest, I never, ever want to take off. My fave pants shape, one of my fave colours, my fave fabric AND they're comfy. Best. pants. ever. Keep an eye out for a blog post in the not too distant future where I pair them with a matching jacket. Yep, it's love. I think that brings my cord collection up to about seven pieces now, but the more corduroy the better, if you ask me. 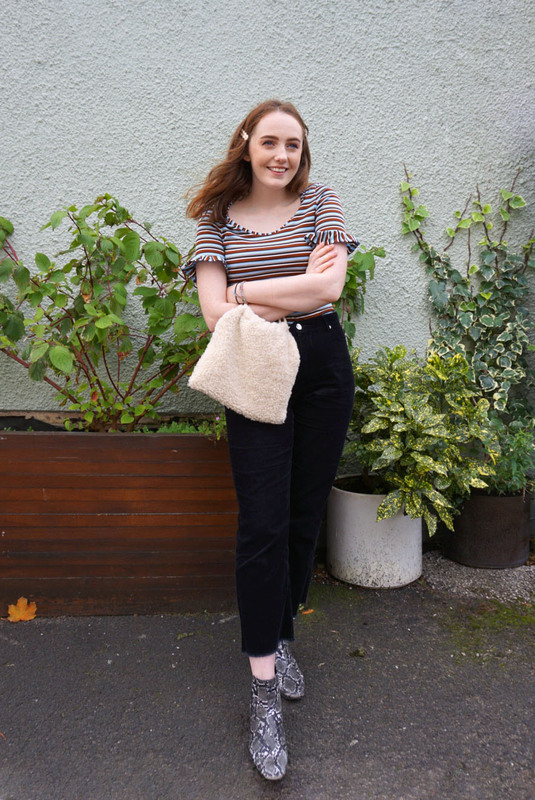 I decided to embrace the brown though, and pair this striped tee with my oh so lovely snake print jacket, which has been getting an awful lot of love lately. Not only does this always go down well on Instagram, but has even gotten a few compliments from strangers on the street! There's no better feeling than when someone stops you to compliment you on your outfit, right? 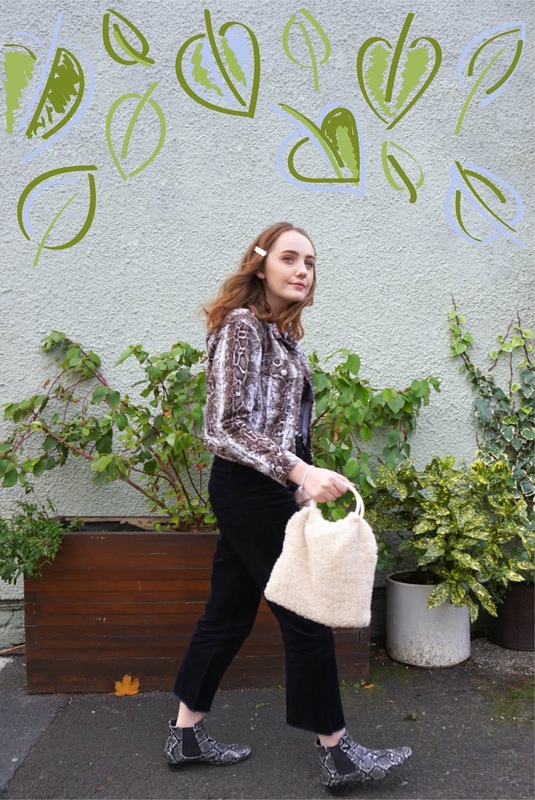 Like in my recent post where I styled merch, I went double whammy on the snake print, because why the hell not? 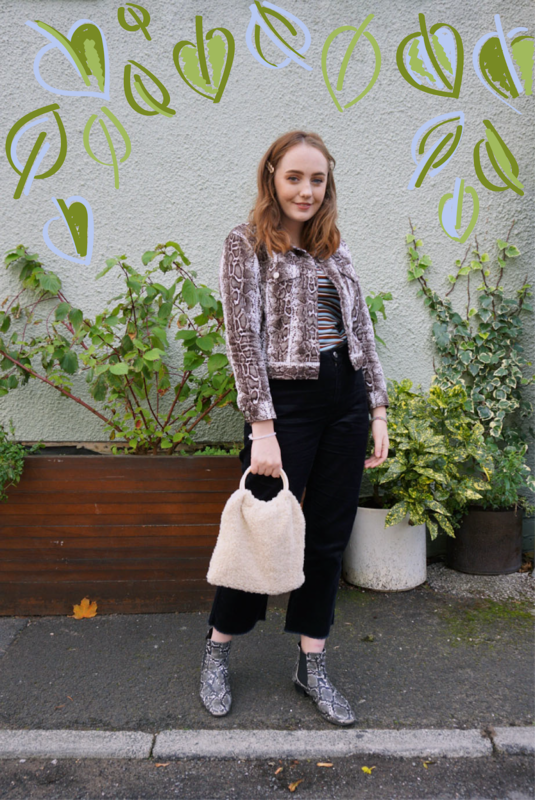 Snake print is another massive trend for aw18 and I hope it's here to stay. Remember, don't be afraid to mix your prints! Two loads of snake print and an extra bit of stripes might sound like a lot on paper, but when the colour palettes compliment each other, it can work like a dream. 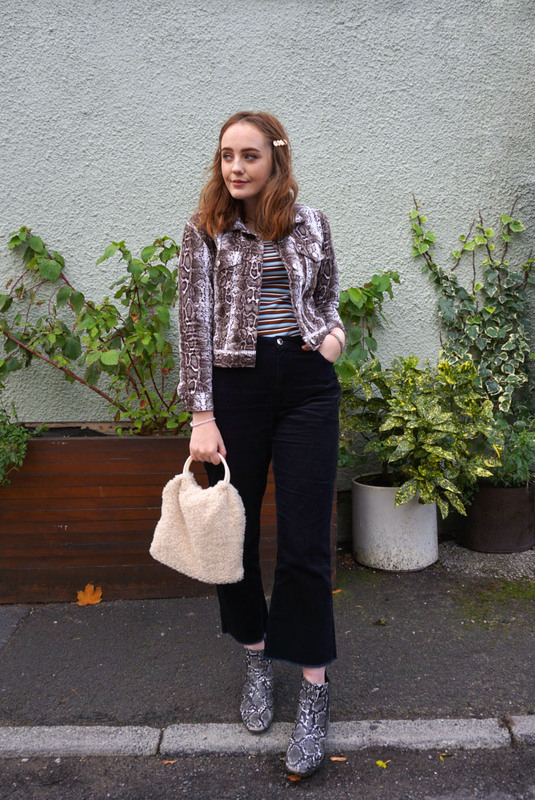 Another few autumn 2018 trends to throw your way are hair slides, round handle bags and a good dose of faux shearling (or teddy fur, if you like). As you may have seen in a recent Insta stories haul of mine, I picked up a few pretty hair clips on ASOS and I haven't taken them off since! My favourite ones are these golden coin ones, which I've used to tuck away my fringe. But don't think hair slides (or barrettes, if you're fancy) are just for your hair. Oh no, you can slide them on to jackets instead of pins or onto berets for a super stylish touch to an outfit. That's a big heap of autumn trends for you, isn't it? 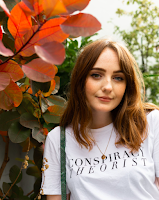 I actually didn't intend for this post to be all about the new season trends but after going through this outfit piece by piece it all came together quite nicely. Be sure to follow me on Instagram to see me styling more AW18 trends in the coming months! *Affiliate links are included in this post. Items marked with * are gifted. All opinions are my own. And as a bonus the bag "Made in Britain"